Consolidated revenues for the nine months grew by 17% y-o-y to INR 5,422 Crores (Standalone: +15% to INR 4,780 Crores). However, in the third quarter standalone revenues grew by 18% y-o-y to INR 1,681 Crores. Standalone pharmacy witnessed revenue growth of 24% for the nine month period. ROCE was at 15% level for the nine months period and over 18% over annualized Q3. New hospitals reported 53% y-o-y growth in revenues to INR 421 Crores. New doctors that are being hired are the anchor doctors or on a guarantee model basis. 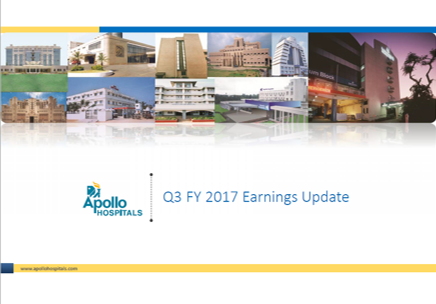 The Navi Mumbai hospital is the first tertiary care facility and with the addition of this new facility, Apollo currently has 13 new hospitals with a bed capacity of 2,400 beds in Mumbai (a capital employed of INR 1,700 Crores). Incremental impact of depreciation and interest cost due to Navi Mumbai Project – Depreciation: INR 2 to 3 Crores per quarter. Benefit of lower interest cost will be seen next year due to low interest rates. EBITDA margins for pre-2008 batch of stores witnessed a growth of 7.4% in the nine months period. About 76 new stores were added in Q3 FY 17 – total number of stores in the network now 2,506. Chennai cluster witnessed a positive growth in IP and OP volumes for the nine month period. Revenues grew by 4% with 12% growth in ARPOB. Hyderabad – observed a double digit growth in OP and IP revenues mainly due to better patient mix (decline in ALOS). ARPOB grew by 17%. Karnataka region – includes the hospitals in Bangalore and Mysore. Occupancy improved from 428 beds to 479 beds in the nine months period. Apollo has partnered with the State Government of Andhra Pradesh in a PPP model to establish 164 Electronic Urban Primary Health Centers (eUPHC). IFC has acquired a 29% stake in Apollo Health and Lifestyle Ltd – an investment for INR 450 Crores. The proceeds will be used to expand its network of clinics, cradles and diagnostics centers across India. The company will focus on elevating the performance of the new hospitals (which were added in the last 3 years) – by enabling the right mix of specialties, reinforcing the local market connect and strengthening the medical teams.